What makes a hero? It depends on who you ask. Merriam Webster defines a hero as someone who is noble, admired and courageous. And even though these aren’t typically the words people would use to describe their employer, we believe it’s time to change that. Employees who work at these organizations feel most like their pay is decided in a transparent process. Find out which orgs are the most transparent when it comes to pay. Employees who work at these organizations feel most like they are paid fairly. Find out if your org made the list! Not all organizations are created equal. Find out which ones are the most satisfying to work for according to employees. You see, PayScale believes that organizations can be heroes, too. In this tight talent market, where employees have many choices as to where they commit their time and talents, it can be incredibly difficult for organizations to maintain a culture that continuously motivates employees and retains their loyalty. The PayScale Hero Awards will recognize organizations that are creating positive and transparent workplace cultures that employees love. What Does It Take to Be a PayScale Hero? We examined more than 276,000 employee profiles from more than 62,000 distinct employers to understand which orgs are the true heroes of 2018. 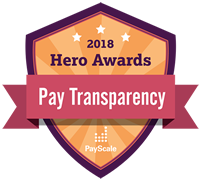 The PayScale Hero Awards features employers who get high marks from their workforce on key employee engagement metrics. To be in the consideration set, a significant number of your employees must have completed the PayScale employee survey. Recent PayScale employee engagement research examined the workplace elements that matter to employees and uncovered which have the biggest impact on satisfaction as well as retention. Throughout 2018, we’ll continue to recognize employer heroes who scored highly with their workforce on each of these elements. Communication – Employees feel there is frequent two-way communication between managers and themselves. Development – Employees feel they are provided with sufficient opportunities for learning. Company Outlook – Employees are confident their employer has a bright future. Relationship with Manager – Employees have a great relationship with their direct manager. Appreciation – Employees feel appreciated at work. Fair Pay Process – How pay is determined is perceived as fair by employees. Transparent Pay Process – How pay is determined is perceived as transparent by employees. Employer Satisfaction – Employees are extremely satisfied working for their employer. Employee Retention – Employees are not planning to seek new jobs outside their current organization in the next six months..
What’s the Benefit of Being a PayScale Hero? Organizations of all shapes and sizes are beginning to recognize the business advantages of having employees in their workforce who are passionate about their work and feel a sense of pride. Organizations who score highly on the PayScale Hero Awards have engaged employees who are less likely to leave their organization — resulting in reduced turnover and associated costs. Engaged employees are more likely to advocate for their organization while also creating a positive influence on the org culture as a whole.